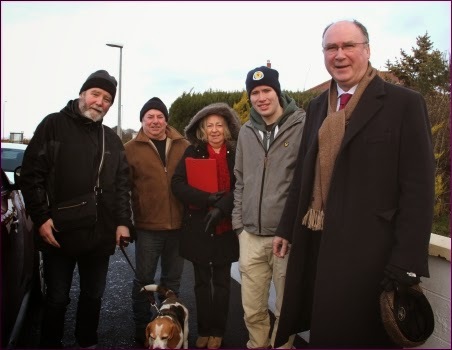 Mike Robb (right of picture), the Labour candidate for the Inverness, Nairn, Badenoch and Strathspey seat currently occupied by Danny Alexander was canvassing with colleagues earlier today in Tradespark. The Gurn had a wee blether with Mike and committed some of that to video for posterity. Apologies for some of the iffy sound (this observer was messing about with audio settings to reduce background noise and it didn't work out too well. Here at the Gurn we hope we will be able to give you occasional details of what the candidates get up to when they are in Nairn between now and May 7th. Regardless of the political leanings of the Gurn team we hope to be fair to all as our readers are obviously drawn from across the political spectrum. So if you party or candidate is doing anything in Nairn please send us details or pictures. We're not interested so much in the macro picture but more interested in what the candidates think they can do for Nairn and would be delighted if they wish to impress our readers with their knowledge of the main issues affecting our community and what they think they can do to help us resolve them. Jim Murphy is now producing near daily promises and policies to try and entice voters back, but back to what? Anonymous 11:19 "Scots want change", sorry, but in the referendum the vast majority of Scots voted NOT to change. ACCEPT THAT. The only 'fact' is that 55% did not vote for complete, full 100% independence a few months ago. I would vote SNP, because I agree with some of their policies, but I never could because of their determination to stay in the European Union. We need to get out quick. Even if we were poorer than we are now, at least we would be our own bosses and able to decide whats best for us. We would be able to take pride in our country again. I wonder how many Scots want out of the EU? Surely if we got independence we would get a referendum whether or not scotland wants to stay in the EU. I think it's fair to say it's not just Scotland, but the whole of the UK would like to see some change given the present economical climate!